In a recent survey by Game Rant it has been revealed that 80% gamers cite story and character development as a key influence on their decision to purchase a game. And 48% of those surveyed also buy based on the emotions the game is likely to enable them to experience whilst playing. One respondent said "I'm more attached to the characters in my favourite video game, than the characters in any of the TV shows I watch regularly". This compares to only 41% declaring the complexity of the game as being a deciding factor, and only 19% considering the skill and dexterity needed to play. Furthermore, only half took into consideration repeat game-play value. When asked to describe the range of emotions they experienced 89% of gamers surveyed described their emotional state as “excited” whilst playing, 79% described “happiness”, and 73% described “frustration” at different times, which is not surprising when 63% of Game Rant’s audience preferred hard games over easier ones. 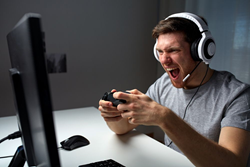 However, Anger was one of the least common emotions, with only 44% of gamers having experienced bouts of anger whilst playing. New, fully immersive role-play games (RPGs) like Destiny, focus on complex stories and character development, over button bashing and dexterity based play that ruled the console gaming industry from the 1970s – 90s. Almost 90% of our surveyed audience preferred “Massively multiplayer online role-playing games” or MMORPGs as they’ve become known to genres such as first person shooter, and platformer.